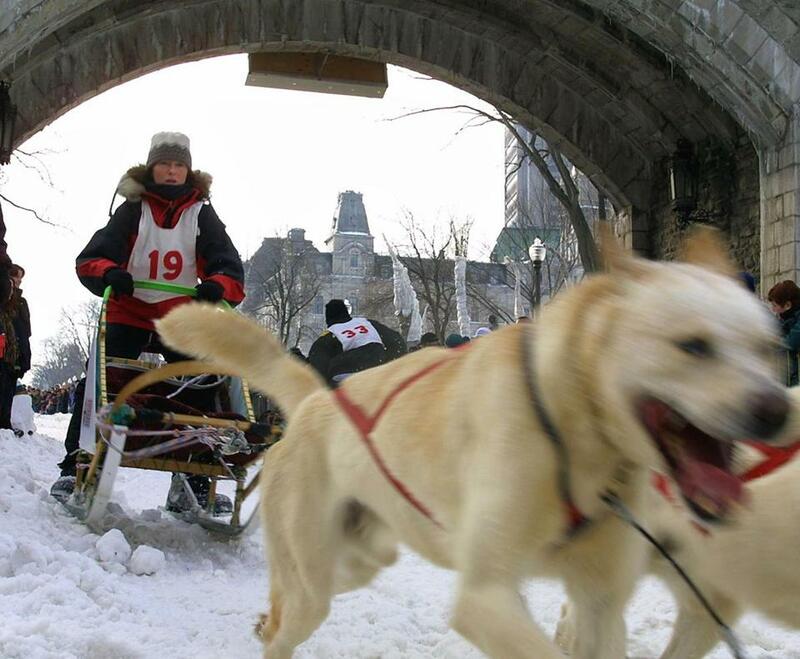 A Quebec musher drove his dog sled through the streets of Old Quebec City during Winter Carnival. With Monday’s solstice looming, here’s some advice for Boston: less dread, more Winter Wonderland. Every February in Quebec City, under conditions far more arduous than ours, people manage to enjoy themselves outdoors. The city’s 17-day Winter Carnival features an ice palace, snow sculptures, an ice race on the St. Lawrence River, and a snow-covered fairground with an ice luge and vendors selling traditional Quebecois cocktails in ice glasses. Elsewhere around town, there are ice bars and even an entire hotel made out of ice. Emulate the locals, and bone-chilling temperatures suddenly seem less daunting: When my friends and I visited a couple of years ago, we donned heavy boots and multiple layers and headed out to see an evening parade. Despite a steady snowfall, the torch-bearers and floats kept moving; the streets were crowded, so we followed others to a good vantage point atop the Old City walls. Afterward, I watched a young mother reassuring her wary kids that sliding down a steep, snow-covered embankment on their behinds was the best way to get back to street level. Maybe Boston, like that mom, could apply more ingenuity during a gloomy winter — and try harder to have fun. For people who lack the means or inclination to ski, it’s easy to regard winter as a mere affliction, especially after a cold, snowy February 2015 broke the MBTA. The region draws barely half as many visitors in the first quarter of the year as in the third quarter, according to the Greater Boston Convention and Visitors Bureau; hotel occupancy in Boston and Cambridge averages about 80 percent for the year but falls into the 60s in December and January. One of the reasons Boston loses young people to the Bay Area, supposedly, is our lousy weather. 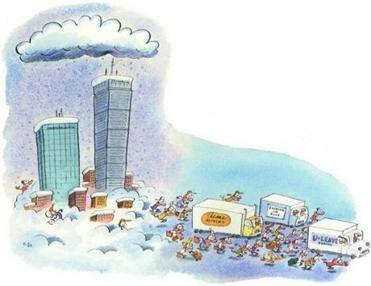 Will Boston’s crazy snowfalls make people leave? An endless winter has everyone threatening to flee for good. Who might really go — and how it could shift the population. But what if Boston winters aren’t a bug, but a feature? The year’s first snowfall is magical. In February 2013, a well-timed Friday blizzard gave lots of Bostonians an unexpected three-day weekend, and abated in time for a glorious “Back Bayhenge,” the alignment of the setting sun with the street grid of an iconic city neighborhood. Rose Fitzgerald Kennedy Greenway Conservancy executive director Jesse Brackenbury offers a long list of events that people in other cities put on in the cold months: Beyond Carnival in Quebec City, there are festivals in Ottawa and Montreal; holiday markets in Chicago, Denver, Philadelphia; and the Winter Village in New York’s Bryant Park. While some kind of multi-attraction wintertime festival would help Bostonians look forward to cold weather, there are subtler ways of promoting outdoor life. Canada’s northermost big city, Edmonton, published a state-of-the-art strategy for cold-weather urbanism in 2013. It envisions lots of skating and cross-country skiing amenities. It also calls for lifting regulations that keep restaurants and stores from using sidewalk patios in cold weather, educating recent migrants about how to dress warmly, and planting evergreen trees in windy areas and deciduous trees in public plazas that need more sunlight come winter. Granted, the natural human aversion to shivering in the cold isn’t just a social construct furthered by the entertainment industry. But with a more intrepid attitude, we might yet come to regret the occasional warm day in January and February. Brackenbury notes that unexpectedly fair weather thwarted a previous Greenway effort at wintertime activation — a set of huge steel chimes, installed in late 2011, that were supposed to make noise as icicles formed and cracked along them. “That was the winter it didn’t snow at all, and we got no ice chimes at all,” Brackenbury says. “Maybe it was a good-luck talisman,” he adds. After the agonies of last February, it seems jarring to contemplate winters that just aren’t harsh enough to enjoy fully. Despite the ice-chimes episode — and unseasonably warm temperatures in recent weeks — cold weather in Boston comes reliably enough, and goes on long enough, that we need to find a way to enjoy it. Dante Ramos can be reached at dante.ramos@globe.com. Follow him on Facebook: facebook.com/danteramos or on Twitter @danteramos.